After having a really great experience at Liquid Bread in Downtown Historic Campbell, I knew there was more great dining to be found. While there are many restaurants that line the main drag, I’m fairly certain that most are not worth my time or money, but if I looked hard enough I could find some gems. 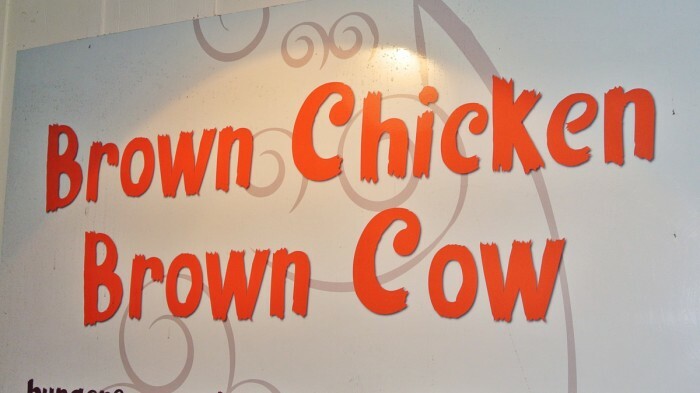 Brown Chicken Brown Cow (best pronounced like “Bow Chicka Wow Wow”) definitely makes you look hard to even find it. Armed with Google Maps and their address and I still struggled to find the restaurant on this single-street downtown area. But it was worth the extra effort and their silly name is perfect for the downright pornographic I consumed. The reason I had so much trouble finding it is that you actually have to go down a mysterious alley that leads to the back side of the all of neighboring restaurants before you reach the practically unlabeled restaurant. 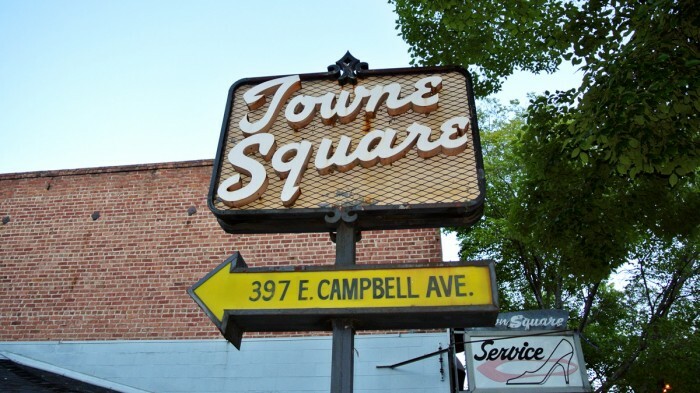 My best advice is to find the Town Square sign and follow the arrow until you see the Brown Chicken Brown Cow sign, then follow that arrow to guide you onward until you actually reach the restaurant. Confusing, I know. Once you actually find it you may notice that the building sort of resembles a clean, nicely polished barn. Everything from the shape of the building to the style of rafters to the horizontally split Dutch doors was barn-like. 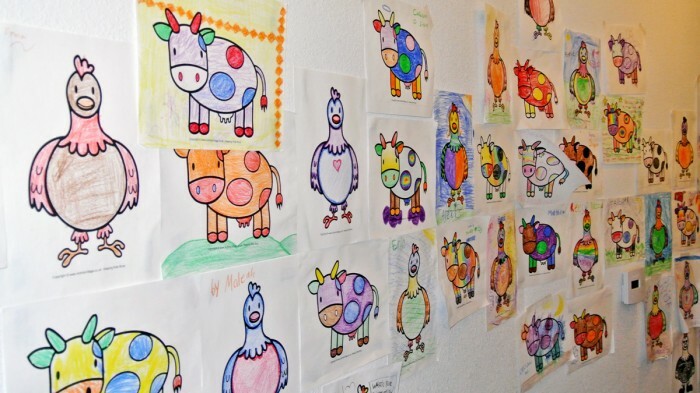 You will also probably notice the entire wall filled with children’s drawings of, you guessed it, chickens and cows. The restaurant was pretty full when we arrived so we opted to sit in their outdoor dining section under one of their gas-powered heating lamps for warmth. After getting settled at our table, we ordered a round of craft beers. 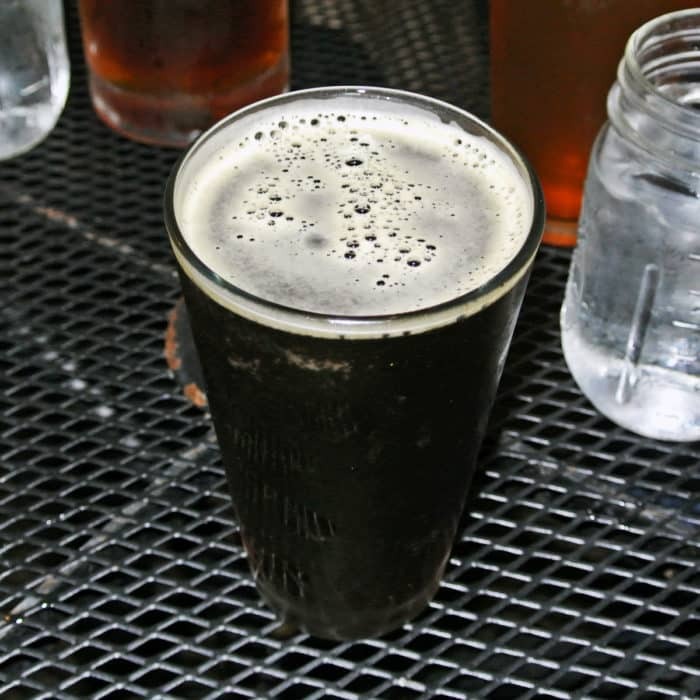 I chose a draft beer brewed locally in San Francisco by Speakeasy Ales & Lagers called Scarlett Red Rye. I love red ales and the smokey taste of rye whiskey so I figured this would be the perfect beer to accompany the hearty dishes ahead. It was a very easy-drinking beer and certainly something I’d order again. Shockingly soon after our beers arrived, so did our dinners. 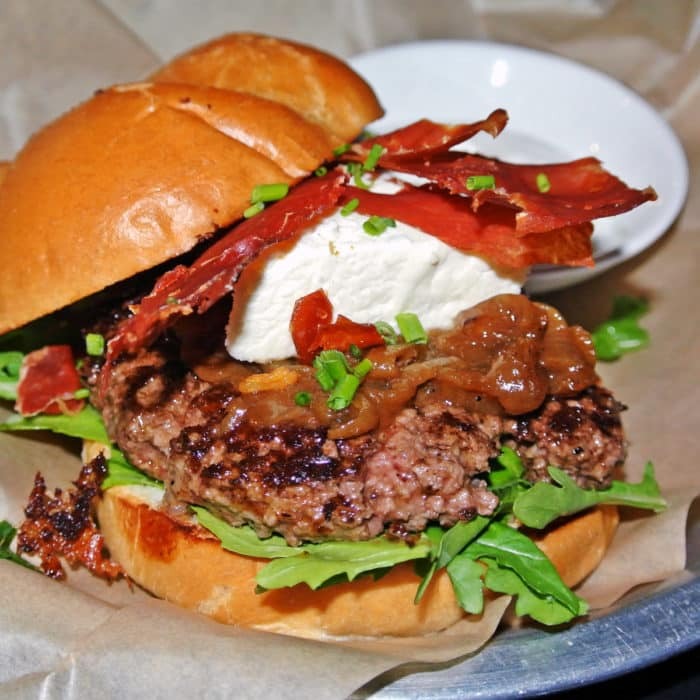 Based on a number of Foursquare tips I had read, I selected the Crispy Prosciutto Burger which was topped with crispy fried prosciutto, triple crème brie cheese, caramelized onions, arugula, chives, and mayo and came served with a side of horseradish sour cream. By default it’s cooked medium, which is perfectly fine for a burger patty of this thickness. The burger was made with grass-fed beef sourced locally from Pacific Pastures in Humboldt and had a nice char on both top and bottom surfaces. Though the large hunk of triple creme brie didn’t melt or spread across the entire burger very well, the flavors and textures of all of these elements combined together really well on top of this crispy, moist burger patty. Especially those crackly, crispy, salty fried prosciutto slices. I’ve never though to fry prosciutto before, but now I know how darn delicious it can be when prepared like this. But that’s not all we had. When I was looking over the menu, there was one more thing that caught my eyes that I knew I had to order for the table. A wonderful monstrosity known as Carnitas Fries. Let me say that again, CARNITAS FRIES. Yes, excellent, thick-cut french fried deep-fried to order topped with melty cheese, chipotle ranch sauce, and a heaping pile of tender, shredded, pork carnitas. Wow. This side dish was seriously serious when it came to eating excessively. And every bite of it was downright delicious. You better believe it. 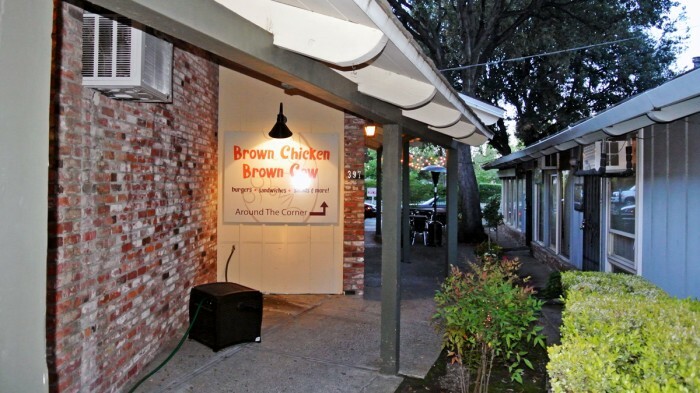 So if you’re in Silicon Valley and want some over the top American comforts, go to Brown Chicken Brown Cow. 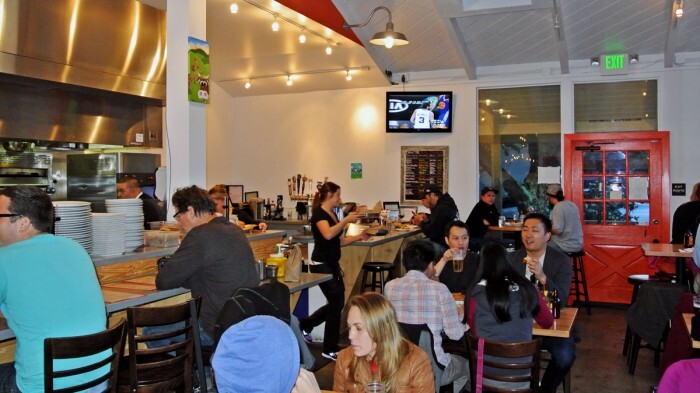 We all loved our burgers and the selection of draft beer. 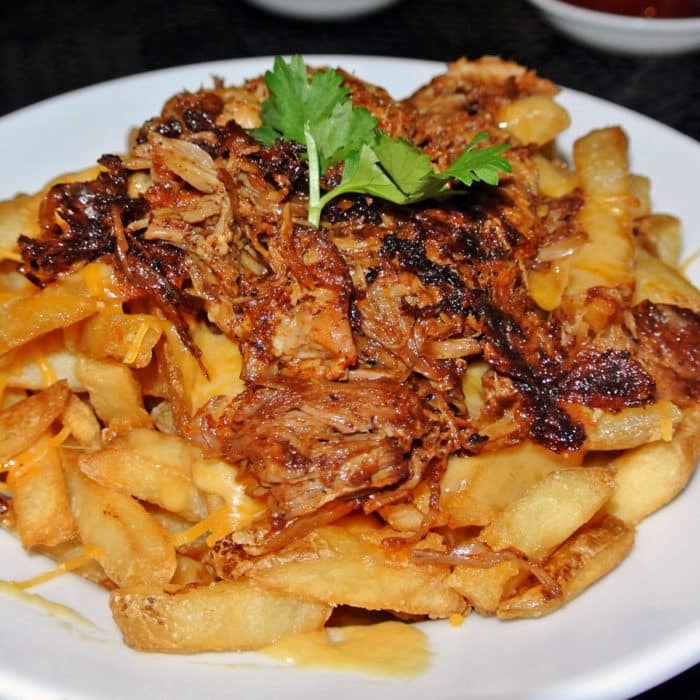 Just make sure you don’t leave without having and order of the absolutely ridiculous Carnitas Fries. Know of another place in Silicon Valley where excess is the name of the game? Let me know in the comments below. Previous PostHidden French Fine Dining at Café Claude in Union Sq.